JACKSON, Miss. (AP) — A video of a white U.S. senator from Mississippi making a flip reference to a "public hanging" is incensing voters in a special election runoff, drawing attention to the state's history of lynching and boosting Democrats' hope of pulling off a stunner in the Deep South. Republican Cindy Hyde-Smith is facing former congressman and former U.S. agriculture secretary Mike Espy, a black Democrat, in a runoff Nov. 27. She was captured on video praising a supporter by declaring, "If he invited me to a public hanging, I'd be on the front row." After the video was made public Sunday, Hyde-Smith said her remark Nov. 2 at a campaign event in Tupelo was "an exaggerated expression of regard" for a friend who invited her to speak. "Any attempt to turn this into a negative connotation is ridiculous," she said. Espy on Monday called the remark "disappointing and harmful." "It reinforces stereotypes that we've been trying to get away from for decades, stereotypes that continue to harm our economy and cost us jobs," he told MSNBC's Chris Matthews. At a news conference Monday with Republican Gov. Phil Bryant by her side, a stone-faced Hyde-Smith refused to answer questions about the hanging remark. "I put out a statement yesterday, and that's all I'm going to say about it," she said. Republicans have been counting on a Hyde-Smith victory over Espy as they try to expand their Senate majority. Her remark may not slow her down in the deeply conservative state, but it has highlighted a battle between Mississippi's past and future and put a painful coda to an election season marked by a resurgence of racism in Southern politics. "It really rocked folks," said Democrat Rukia Lumumba, co-director of The Electoral Justice Project and a native Mississippian whose family has deep roots in the state's politics and civil rights activism. "The fact that she has yet to apologize, to recognize the impact of her comments or that people have suffered ... I hope it makes us feel the urgency." The words undoubtedly raised the profile of a race that has largely flown under the national radar. 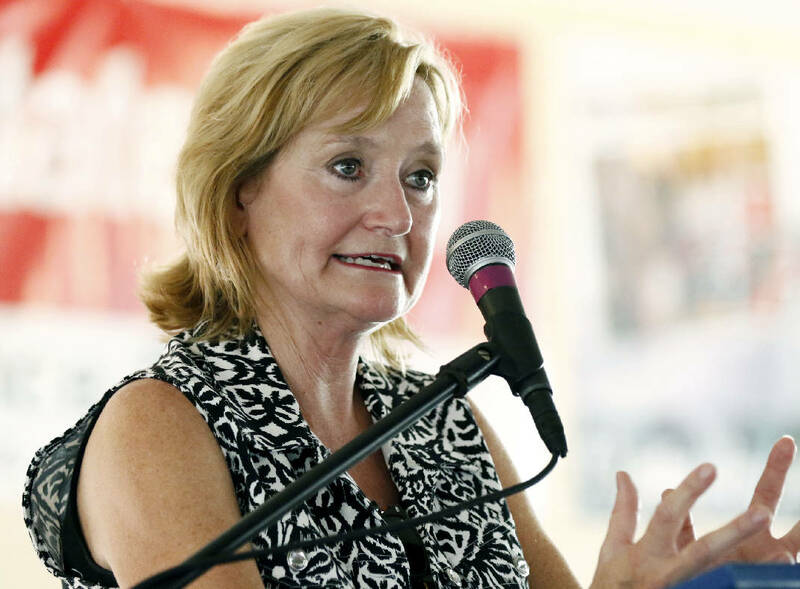 Hyde-Smith was appointed to fill the seat vacated by longtime Republican Sen. Thad Cochran when he retired in April, and she ran this fall to hold the seat for the remaining two years of Cochran's term. She and Espy each received about 41 percent of the vote in a four-person race to advance to the runoff. Another Republican won 16 percent. The results suggest Espy has an uphill battle, but some in the state see him as a rare Mississippi Democrat who could pull off an upset. Buoyed by Democrat Doug Jones' victory in the U.S. Senate race in Alabama last year, Democrats have been organizing in Mississippi for months. Black voters in particular have powered the effort, seeing it as a moment for generational change. "This race matters because voters are deciding: Are we going to move forward or are we going to move backward?" said LaTosha Brown, co-founder of Black Voters Matter Fund, a voter turnout group that was a key organizer behind Jones' victory. Bryant, who appointed Hyde-Smith, defended her Monday, saying, "There was nothing in her heart of ill will." "All of us in public life have said things on occasion that could have been phrased better," he said. "She meant no offense by that statement." Mississippi has long struggled with race and racism in its politics. The state still uses a state flag adopted in 1894 that includes the Confederate battle emblem, though all the state's public universities and several cities and counties have stopped flying it. Another Republican from Mississippi, Trent Lott, lost his position as Senate majority leader in 2002 after saying at the 100th birthday party of South Carolina U.S. Sen. Strom Thurmond that Mississippi had proudly voted for Thurmond when he ran a segregationist campaign for president in 1948. A Republican member of the Mississippi House, Rep. Karl Oliver, was criticized in May 2017 after he posted on Facebook that people should be lynched for removing Confederate monuments. Espy in 1986 became the first African-American since Reconstruction to win a U.S. House seat in Mississippi. If he defeats Hyde-Smith, he would be the first African-American since Reconstruction to represent the state in the U.S. Senate. Hyde-Smith, who is endorsed by President Donald Trump, is the first woman to represent Mississippi in either chamber of Congress and is trying to become the first woman elected to the U.S. Senate from the state. AP VoteCast, a survey of the electorate, showed significant differences in voting behavior by age and race in Mississippi's special election. Hyde-Smith leaned heavily on the support of white voters, older ones in particular. Overall, 57 percent of white voters supported Hyde-Smith, 21 percent voted for Espy and 18 percent supported Republican Chris McDaniel, who placed third last week. Black voters overwhelming broke for Espy: 83 percent supported the Democrat, according to AP VoteCast. On Monday, local groups held a conference call to discuss their turnout strategy and response to Hyde-Smith's remarks. A protest is scheduled for Friday in front of Hyde-Smith's office. Brown said Black Voters Matter, which has an office in the state, will hunker down there in the two weeks leading up to the runoff. "This race is going to be won by folks from Mississippi," Brown said.